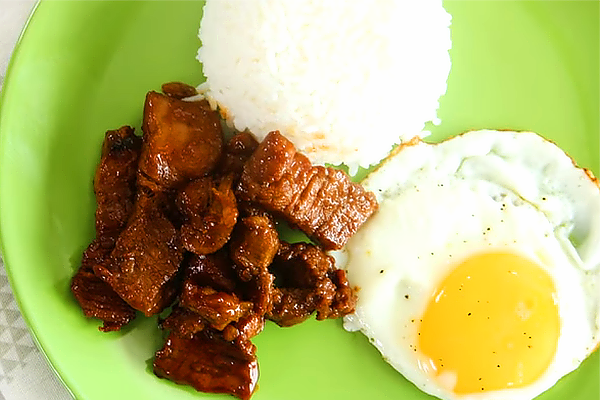 This recipe is the best meal for breakfast or for baon too. 1 Combine pork tenderloin, salt, coconut sugar, minced garlic, pineapple juice, and black pepper in a bowl. Leave in the refrigerator to marinate overnight. 2 In a pan over medium-high heat, place tocino. Add the marinade and 1/4 cup water, cook until liquid is reduced. When pan is almost dry and marinade is syrupy, stir frequently to allow meat to cook evenly. Once meat has caramelized, remove from heat. 3 Serve with rice and egg, if preferred. This recipe is originaly posted and owned by YUMMY Ph, picture screen grabed from YUMMY Ph YouTube channel. Visit their channel to see more of their recipe.